A refreshing, summer taco that bursts with fresh flavors and textures. 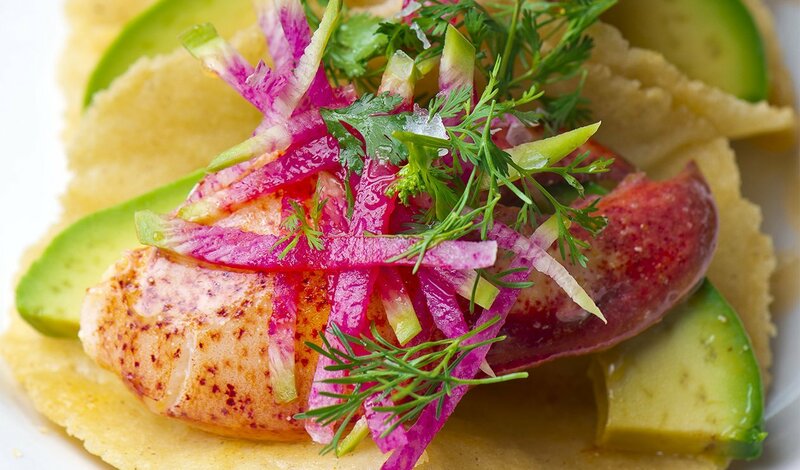 Tangy cotija lime mayonnaise pairs with the sweetness of the buttery lobster. Place crumbled cotija cheese in a bowl. Add mayonnaise, lime juice and lime zest. Mix well while still leaving the cotija cheese crumbled. Season to taste with salt and thin with a small amount of water if necessary. Quickly grill or sauté the lobster with butter to warm through. Set aside. Combine all ingredients and toss well to combine. Season with salt and pepper. Set aside. Warm 3 corn tortillas. Spread with 1 Tbsp of Cotija Lime Mayonnaise. Top with a slice of avocado and 2 ounces of lobster per taco. Finish with the watermelon radish slaw.